Graeme Thompson has published the first extract from his new biography of Kate,“Under the Ivy: The Life & Music of Kate Bush” on the book’s blog page. This very interesting extract covers the Aerial recording sessions with insights from Peter Erskine, Steve Sanger, Chris Hall and Susanna Pell, among others. More extracts will be added to this blog in the near future. Also, a large article taken from this new book will be featured as the cover story of the June edition of Uncut Magazine, in stores this week. 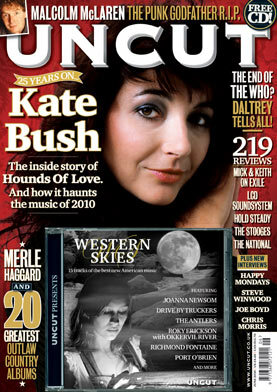 The Uncut piece will focus on the Hounds of Love album, as it approaches its 25th anniversary this year. For more on the book, out May 4th, see the 13th March news below. This entry was posted in Books & Magazines, Kate Bush news and tagged biography, book, magazine. Bookmark the permalink.